Want to go on a memorable 3 night holiday & spend less than RM1500 in total covering meals, accommodation, transportation & souvenirs? You don't have to look any further than our good ol' neighbour, Indonesia. 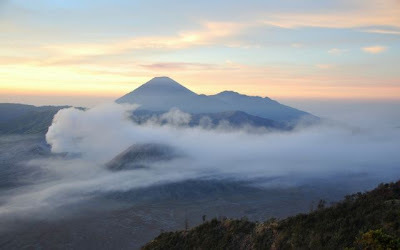 I was in Indonesia with my girlfriend, to view the sunrise at a lookout point overlooking the plains & 3 mountains including the world famous active volcano, Mt Bromo. 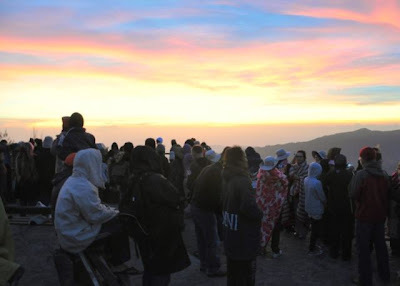 Dear friends, let me share with you that the sunrise at the Bromo Highlands is something you MUST SEE BEFORE YOU DIE. It is breathtakingly picturesque & probably something you will never be able to experience anywhere else! No photo will be unable to capture the beauty of the experience. I took a lot of time just standing there taking in the beauty & praising God for his creation. Furthermore, there's nothing more romantic than holding your girlfriend in your arms while the both of you watch the whole world light up before you. 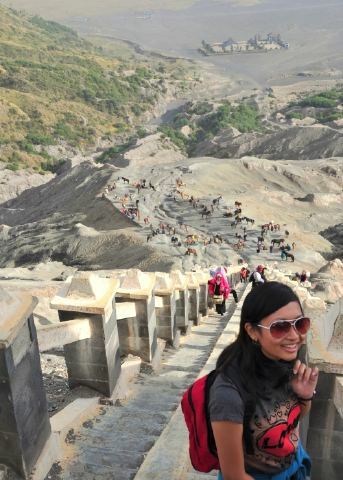 How did I get to the Bromo Highlands? I took a flight to Surabaya (the nearest airport) & took a 2-3hr train ride (75k rp) to Probolinggo (the stopover town). 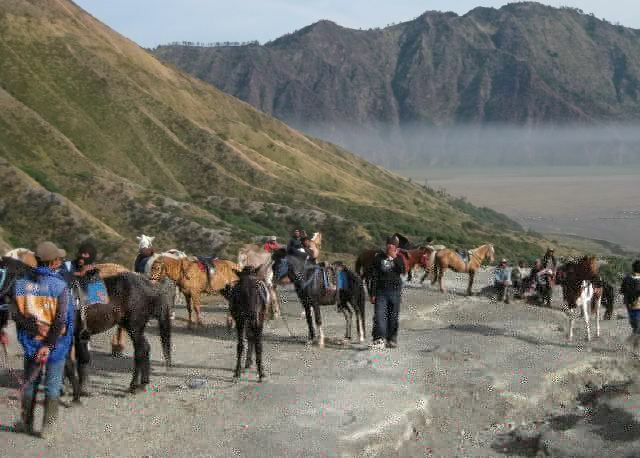 At Probolinggo, a private air-conditioned transport (200k rp) arranged with my hotel took me to the Bromo Highlands (about 1.5hrs). Actually, the air-conditioned transport is unnecessary because soon you'll be high enough to enjoy the cool mountain air. Non air-conditioned transport costs only 150k rp. There is also public transportation you can take. It's significantly cheaper but it will cost you time. You will have to hire a "becha" (bicycle taxi) from the train station to the bus station & hop on any of the green minibuses which will stop at every hotel in the highlands. Bear in mind that the minibus will wait until it is full before departing so find one that is almost full. Take the minibus only if you have plenty of time & minimal baggage. I stayed at Yoschi's Guest House. It's a charming hotel with remarkably friendly & helpful staff. 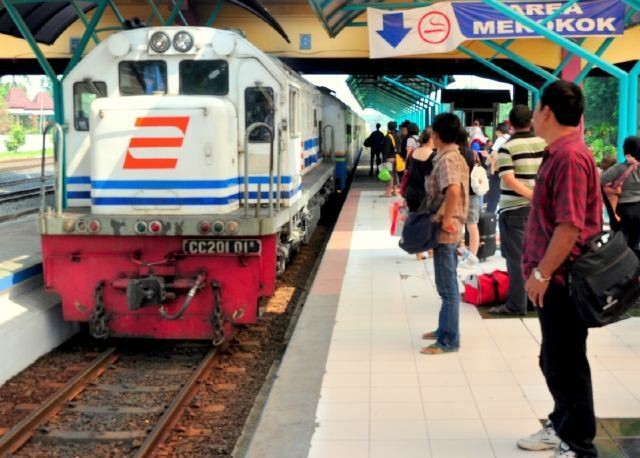 I arranged my transportation to & from the Probolinggo train station with the hotel. I also arranged for my trip to Mt Bromo with the hotel. They were helpful and willing to explain all our options. I took a room with an en suite which costs 200k rp per night. 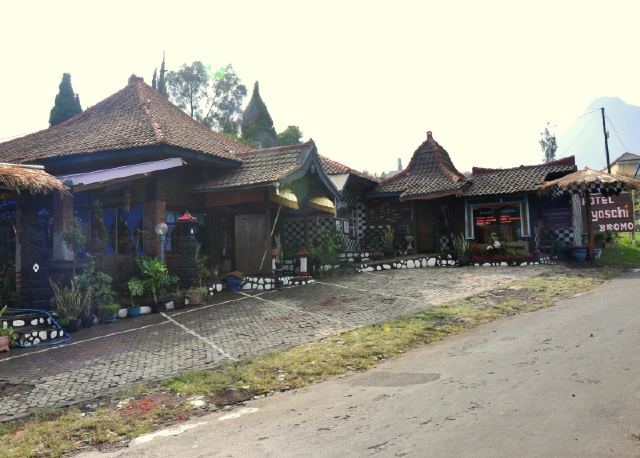 The hotel experience is like staying in a traditional Indonesian rattan/wooden house! Do remember to bring along some repellent because there are lots of mosquitoes at night. The restaurant serves very elaborate & delicious Indonesian as well as Western fare. They serve the same menu for lunch & dinner but they have a special menu for breakfast. 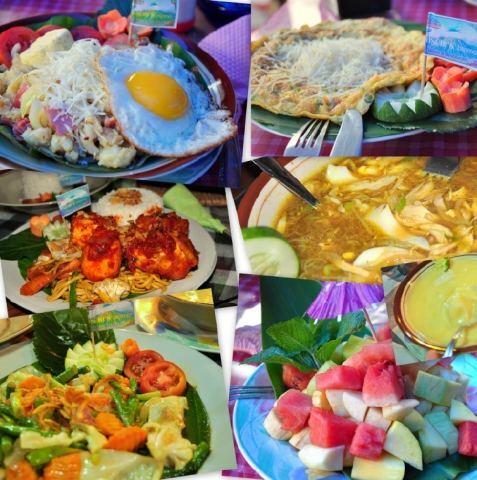 I recommend the Nasi Campur Yoschi, Sup Soto-Ayam, the potato breakfast dishes & the Indonesian pancakes. Our 3 meals (for two) costed us around 250k rp. 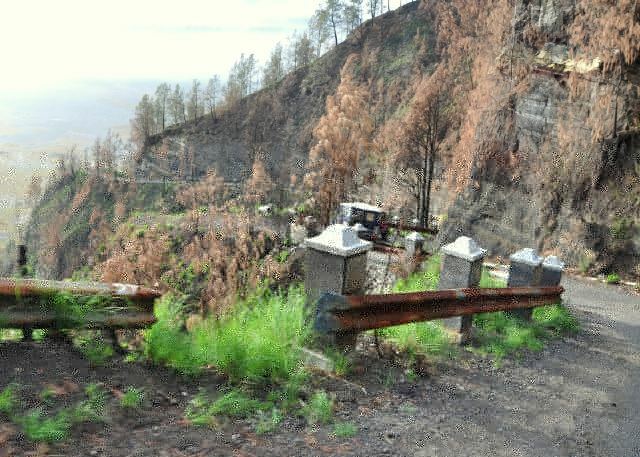 To get to the lookout point, we had to leave the hotel at 3am in a jeep. You could charter a jeep for private use for 300k rp or you could do what I did, share a jeep with ppl from other hotels for 100k rp per person. The jeep took us through extremely steep climbs, sandy plains & snakey mountain roads for about 1.5hrs before we arrived at the lookout point. At one point there is an entrance fee to pay. It is 25k rp per foreigner. Indonesians pay a cheaper fee. It was very cold at the lookout point so remember to bring some warm clothing or hire some from any hotel for around 30k rp. There were many local & foreign visitors that day. On our way back to the hotel, we stopped for a trek to the top of Mt Bromo. 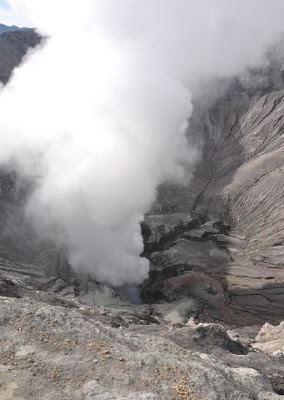 I've never seen an active volcano up close so I was very curious. But it was a veeeeeeeery long walk. The picture above was taken at the top of the mountain. But to get there is a tiresome 30 min walk on sand from way before the Hindu temple at the base of the mountain. There are horses you can take for 20k-50k rp depending on how far away you are from the top. And because of these horses, those of you who decide to go by foot like the strong & adventurous me, will have to watch our steps because there are loads and loads of horse sheet &, at some areas, the concentration of horse urine is so thick that it makes my eyes tear. Here are some things I've learned from travelling to Indonesia. Not looking at the conversion rate, I was surprised to find that the value of Indonesian money is high. The cost of living must be so high because the value of 1k rupiah is roughly 70% of RM1 and it is not easy for them to make 1k rp. You will find that the prices of certain things in Indonesia are not too much different from those back home. However, thanks to the generous conversion rate, you can experience premium items at a hefty discount! There is a tipping culture in Indonesia. Taxi drivers will be extra friendly, porters will be extra helpful & waiters will be extra hospitable. When they are, give them a few thousand rp as a tip to express your appreciation. There are 3 types of tickets: First Class, Business Class & Economy Class. First Class tickets place you in quiet airtight air-conditioned 2 seater carriages. Economy Class tickets place you in carriages that are overcrowded & never to be considered by weary travellers! Indonesia is a country with a high crime rate & harsh living conditions. Make sure that your valuables are secure & be aware of pickpockets in crowded areas. Foreigners should never wander the streets at night or, in some places, even during the day. Be aware that people who want your business will follow you & pester you to hire them or buy their products. Be safe & be wise when you are in the cities.